With 500 trees of 150 varieties, Hartford's Bushnell Park is an oasis of calm natural beauty in the middle of the busy city. In 1853, Reverend Horace Bushnell of Hartford realized that his home city was rapidly being developed and industrialized, so he initiated a movement to preserve a large swath of land in the city's center as "an outdoor parlor" for all to enjoy. Rev. Bushnell's dream became the first municipally-funded public park in the USA, and led to Hartford's developing one of the most extensive public park systems of any US city (map). Like so many other great city parks in the USA, Bushnell Park was laid out by the famous landscape architect Frederick Law Olmsted, the Hartford resident who also landscaped Central Park in New York City, the "Emerald Necklace" of parks in Boston, and Montreal's Mount Royal Park. Olmsted is buried in Old North Cemetery, one of the elements in his network of Hartford parks. The twin-towered Gothic gateway on Trinity Street is Hartford's memorial to its Civil War dead. Be sure to visit the park's carousel, one of the finest restored merry-go-rounds you'll ever see, complete with calliope and automatic drums and cymbals. It is by no means only children who take rides on this historic fun machine. The carousel has three types of seating accommodation: "lovers' chariots" for the unadventurous, stationary wooden horses, and horses that move up and down. Remember to grab for the brass ring! Note that the carousel doesn't operate on Sunday, and you must see it with all the lights on and the music trilling to really get the feeling. 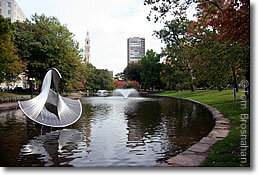 Bushnell Park: a breath of fresh air in the center of Hartford, just below the State House.